The H/K/B Cosmetic Surgery Mother’s Day 5K presented by SPORTPORT is coming up May 12 – it’s time to register! We LOVE the Mother’s Day 5K – it’s the new family tradition to starting off your Mother’s Day weekend by celebrating all that is special about all of you Smarty Moms. Although the event is designed to celebrate the moms and moms-to-be, the race is designed for the entire family to participate – yes, Dads and boys too! There will be great activities for the kids (face painting, bouncy house, make a card or sign for mom, etc.) and FREE Mimosas and beer for our beautiful moms. The event promotes a healthy lifestyle with a focus on fun, family, and community spirit AND it’s baby-jogger-friendly! 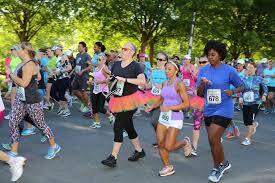 Sign up now for the best Mother’s Day run in Charlotte! Participants will pick up their bibs, t-shirt, and any other giveaways during packet pick up. PARKING is available in the ramps at Piedmont Town Center near Taco Mac. You can pick up a packet for a friend or family member. Congrats to our Smarty Winner!